Folded down over the windscreen. Pulled out of the bracket and swung over towards the door . 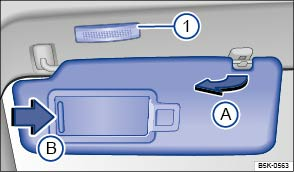 A vanity mirror is located behind a cover on the folded down sun visor. When you open the cover , a lamp ① lights up. The lamp goes out when the vanity mirror cover is pushed back or the sun visor is folded upwards or rotated forwards as far as it will go. In certain circumstances, the lamp above the sun visor will go out automatically after a few minutes. This prevents the battery from discharging.